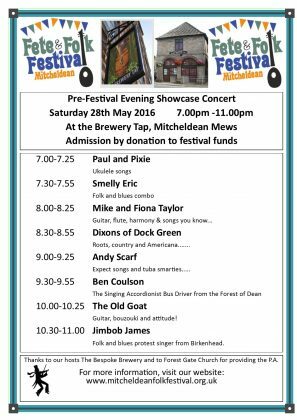 Come along to our pre-festival concert at The Brewery Tap in Mitcheldean on Saturday 28th May. Eight great acts will be performing between 7.00-11.00pm, giving you a taster of what is to come in this year’s Mitcheldean Fete and Folk Festival. There will also be an opportunity to purchase (at only £1.50) the 20 page Festival Booklet and Programme, and also, in case you missed it, (at only £5) the sampler 19 track CD from the 2015 festival. There’s also a fantastic selection of beers, ciders and more on sale at the “Tap”. The event is entry free although you may be cordially invited to make a contribution towards the festival’s expenses fund!